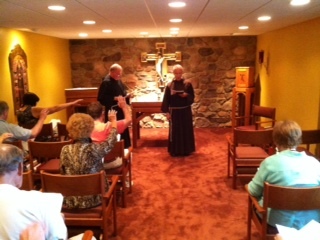 This retreat was given by Brother Al Mascia, OFM, a Franciscan brother who serves the poor in Detroit, Michigan. The Franciscans lost their residence in Detroit several years ago due to an abandoned high rise building structure falling partly on their residence and church. Brother Al was eventually offered the opportunity to use a kitchen to cook in. He then went out bicycling hot sandwiches and drinks to the poor. He did this for about 2 years. About a year ago, a van was donated to the Franciscans from a medical supply company. The van has allowed and inspired Brother Al and Brother Michael to increase their ministries and outreach such that they can go into Detroit as well as the surrounding communities. Also, he can not only feed the poor, but he can provide services such as Nutrition, Literacy, Art and Music programs, Health Education, and Cultural Enrichment. His van is named the Care A Van and Song and Spirit Institute for Peace is also written on the van. The web site is www.Songandspirit.org. 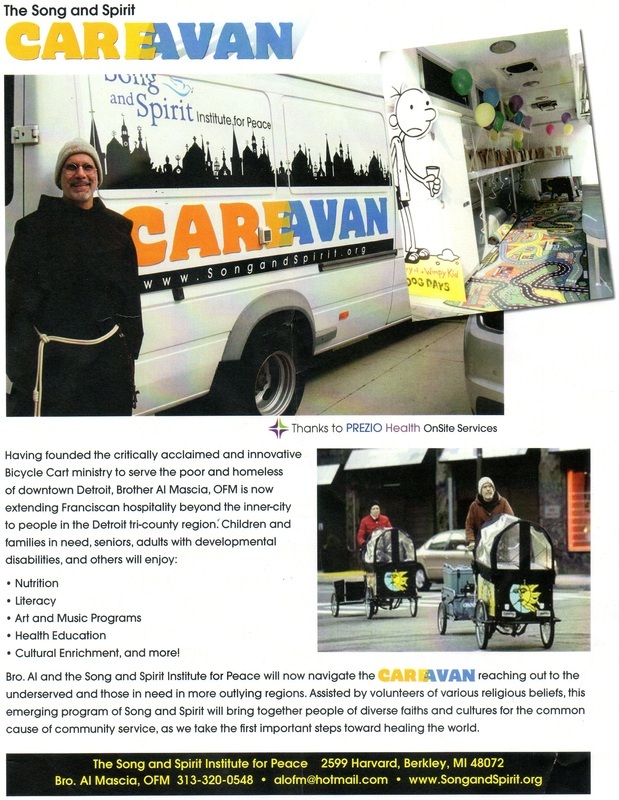 The van has allowed Brother Al, with support from others, to provide inspiration to children of all ages in many ways. His stories are nothing short of delightful and filled with inspiration from the Holy Spirit not to mention awesomely creative. 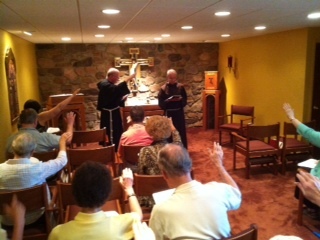 The theme of the retreat was the year of Faith that Pope Benedict has announced beginning October 13, 2012. This year of faith challenges the faithful towards a New Evangelization. Brother Al provided us with the deeply theological information on this. However, he is also a songwriter and guitar player. His songs are absolutely charming with Franciscan “soul” delivered with a mellow clear, inviting, story telling voice. Truly he is a troubadour. He also has some stories and slides about his work that are amazing, one of a kind and priceless jewels of life experience. On Saturday night we held a special Awakening Sabbath Peace prayer service. This special service allowed us to feel the holiness of the Sabbath in a new way. We lit a candle that a man makes for him who is in his 80’s. He makes these beautiful candles from candles used at Easter. They last for 24 hours and are intended for use to keep Sunday holy. He also brings with him some delightful one of a kind gift items as well for his ministries such as the Domeni Candela or Sunday candles, beautiful handmade tiles, and CD’s of his music. Brother Al helps us to realize the individuality and calling of each of us just by sharing his own journey. He also shares the amazing journey he has been on that has led him to be a Franciscan brother. More than that, he shares some incredible visions that he has for plans in the future. I would be honored to help this ministry financially. A friend of mine heard one of the music CD’s yesterday and immediately knew he wanted a copy.